If a currency can’t be converted on demand into the underlying commodity, it’s not “backed by oil,” it’s just another form of control fraud. The broke and broken country of Venezuela appears to be the first nation-state to issue a cryptocurrency token (the petro) as a means of escaping the financial black hole that’s consuming its economy: Maduro Launches Oil-Backed Crypto “For The Welfare Of Venezuela”. The gee-whiz component of the petro is that it is supposedly “backed by oil.”In other words, unlike other cryptocurrencies/ tokens, the petro has intrinsic value because it’s backed by oil. The only way any currency, fiat or crypto, is “backed” by any real-world commodity is if the currency is convertible into the commodity on demand, that is, the currency can be exchanged for the commodity at a transparent published conversion rate. If Venezuela’s petro cannot be converted directly into deliverable-upon-demand oil contracts, it’s not backed by anything. It’s important to understand that any currency that claims to be “backed” by gold, oil, rice, bat guano, etc. must be convertible to the underlying commodity at a transparent conversion rate. If a currency can’t be converted on demand into the underlying commodity, it’s not “backed by oil,” it’s just another form of control fraud, which I define asthose holding power in centralized institutions enrich themselves at the expense of the citizenry by modifying what’s legally permissible. Conventional fraud is against the law; control fraud is legal because it benefits those who make the rules. If there is no transparent mechanism for converting petros into oil that can be sold and delivered in the global marketplace, then the petro is nothing but a central-state control fraud: those foolish enough to believe the con that the petro is “backed by oil” will end up with a worthless token. A bit of history will clarify “backed by something real” conversion. In the 1960s, the US dollar was famously “backed by gold,” which meant that other nations (via their central banks) could convert $35 USD into an ounce of gold upon demand. As U.S. trade and federal budget deficits soared in the late 1960s, nations such as France began converting their excess dollars into physical gold. If this conversion had been allowed to continue, foreign entities would have drained all of America’s gold as they converted their dollars (exported via trade deficits to other nations) into gold. As a result, the U.S. had no choice but to end the conversion of dollars to gold. The notion that China or Russia will issue a gold-backed currency attracts considerable attention, but a currency is only “backed by gold” if a foreign financial institution can convert their yuan or rubles into gold upon demand. If there is no transparent, easy mechanism for foreign holders of the currency to convert their currency into gold upon demand, then the currency isn’t actually backed by anything: it’s simply a form of control fraud. It doesn’t matter if the currency is digital, paper or crypto: if it can’t be directly converted into the underlying commodity at a transparent published conversion rate, it’s not backed by anything. 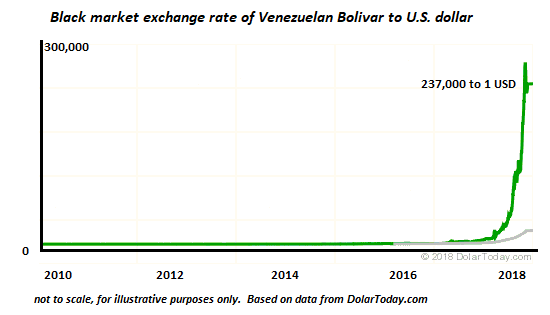 Until a foreign financial institution successfully converts its Venezuelan petros into actual barrels of oil, or oil contracts that can be sold immediately on the global market, then the petro isn’t backed by anything. Until that conversion process is functioning transparently, the petro is nothing but a giant control fraud perpetrated to benefit the few clinging to power in Venezuela at the expense of the many.